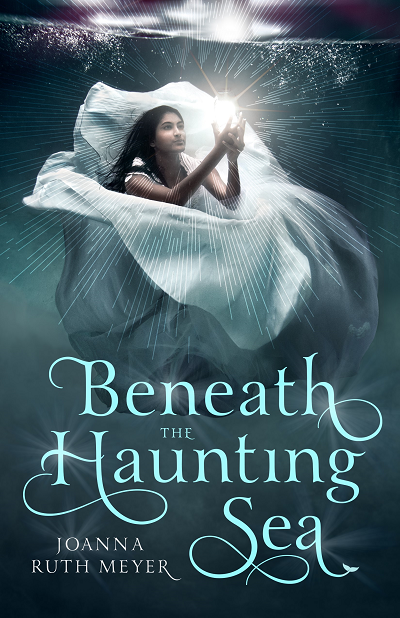 Beneath the Haunting Sea, Joanna Ruth Meyer’s young adult fantasy debut novel, is a tale about fate, love, courage, selflessness, and determination built upon forgotten history, myths, and family secrets. It’s a lovely story—even a book I found rather difficult to put down during the second half—but there are some issues with its execution despite being enjoyable overall. Shortly before her sixteenth birthday, Talia learns that the dying Emperor is her biological father and that he intends to announce that she is his official heir at her coming of age party. However, he does not appear during this occasion, and the celebration is instead interrupted by a young woman long rumored to be the Empress’ daughter herself, bearing the news that the Emperor has passed away. She claims that he declared her to be the new Empress before his death, accuses Talia and her mother of plotting to take the throne, and punishes the two alleged traitors with banishment to a distant island. Beneath the Haunting Sea is a wonderful story with some drawbacks that hold it back from being a wonderful novel. Although I did race through the second half of the book wanting to know what happened next, it did take around 150 pages to become at all immersive, largely because pacing earlier in the book is extremely uneven. The first 2–3 chapters are a whirlwind: Talia discovers she’s to be the next Empress, and then she’s overthrown and banished before she can even take the throne. After that, it seems to drag for quite awhile, and the sea voyage seems long even though it does skip over much of the mundanity of the half-year spent traveling to focus on the most relevant parts. At this point, not enough information about the world’s mythology has been revealed, and it lacks a tantalizing hook to inspire speculation and more than vague curiosity about Talia’s mother’s agitated state. After Talia arrives at her destination and begins trying to unravel the mysteries and secrets of the Baron’s house, it becomes much more engaging. The household includes the Baron and his two sons, who are complete opposites, and there are some rules and family tensions that Talia does not yet understand as a newcomer. The elder of the two young men, Caiden, is at odds with his brother, Wen, a composer who turned down the opportunity of a lifetime because of a vision from the gods—to the dismay and puzzlement of the rest of his family. Furthermore, Talia hears whispers about the house being cursed and the deaths of both Baronesses, but no one seems eager to share details with her. There is a love triangle involving Talia, Caiden, and Wen, and I actually thought this was one of the better aspects of the book. Though it at first seemed to be a way to add drama (and did, of course, add drama), it also showed a lot about each character and their personality. I don’t want to give away too much about how it unfolded, but I thought Talia’s feelings made perfect sense and her reactions along the way demonstrated who she was. The resolution is satisfying, and it does end up being a sweet love story. Other than Talia, I didn’t feel that any of the characters were especially fleshed out, but I did find her to be well characterized. She’s curious, stubborn, rebellious, and courageous, and she’s also a heroine who grows, changes, and learns from her mistakes. In particular, she struggles with her beliefs about the gods and fate, which changed when her father (not the Emperor but the man who raised her) died. Though the world mythology was compelling, I thought that the introduction and integration of these elements were among the weaker aspects of the novel. As I mentioned earlier, the old stories (and Talia’s disdain for them) were first referenced without adding much spark to them, and the foundation of the world was told via a flashback of Talia’s mother relating a rather generic legend to her as a child. As these tales progressed, they did become less standard and took on more of a life of their own; however, they continued to be conveyed through chunks of text via flashbacks or Talia’s reading rather than being seamlessly woven into the novel. Like the rest of the book, the prose is polished and readable (even if it didn’t stand out to me as particularly beautiful or unique), but I found this to be a dull way of discovering the universe. That said, the mythical parts of the novel that took place in the present are more vivid and interesting, although I did feel the climax was rushed, especially when compared to earlier in the novel. Beneath the Haunting Sea is a wonderful story, and it’s also a complete story with a solid ending. Personally, I felt the romance and the mysterious atmosphere surrounding the house by the shore worked better than the fantasy part, which takes some time to develop into more than a bland tale surrounding uninspired gods and goddesses. Regardless, it does hit its stride and improve later, and I am glad I read it even if it’s not quite strong enough to be a memorable book I expect to revisit in the future. Where I got my reading copy: ARC from a publicist.